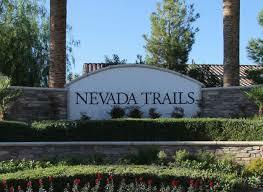 GORGEOUS, EXTREMELY UPGRADED HOME IN NEVADA TRAILS. THIS BEAUTIFUL ONE STORY OPEN FLOOR PLAN HOUSE HAS GOURMET KITCHEN W/STAINLESS APPLIANCES, BUILT IN REFRIGERATOR, 42 DARK MOCHA CABINETS, GRANITE COUNTER TOPS, BIG ISLAND, TILE AND LAMINATE FLOORING THROUGH OUT. CASITA IS 4TH BEDROOM. CUSTOM FENCE AT THE ENTRANCE, LEASED TESLA SOLAR SYSTEM, POOL W/JACUZZI AND WATERFALL. VERY PRIVATE BACKYARD. WHOLE HOUSE HAS WATER TREATMENT. MUST SEE. Nevada Trails Stunner* Rare & desirable floor plan centers around interior courtyard w/casita & full bath* 4 bedrooms + den* Gourmet kitchen w/granite counters, stainless appliances, beautiful cabinets, island & butlers pantry* Real wood floors, plush carpet, travertine, shutters, ceiling fans, custom lighting, faucets & fixtures throughout* Huge master bed w/spa like bath* Custom closets* Over-sized lot* EVERYTHING UPGRADED & TOO MUCH TO LIST! Modern living in Gated Brookshire by William Lyon Homes. Close to 215, Restaurants, Shops, IKEA. xD; xA;Upgraded cabinets, SS Appliances, energy efficient. Bedroom Downstairs. Just WOW! Professionally designed modern dream house. Home features 3k sq-ft, 4 bed, 3.5 bath, 3 car, corner lot, gated comm, Vaulted ceiling, tile floors, panel doors, blinds, custom cab T/O, quartz counters w waterfall edge, SS app, custom lights, surround sound, 3 tone paint, custom showers, modern railing, built-ins, master bonus room, full custom master bath, covered patio, modern backyard, spa, big side-yard, to much to list!! It has arrived, your dream oasis on almost an acre is here! Location, location location! This 2,104 sq ft. features spacious floorpan, stainless steel appliances, white cabinets, granite counters. This home has 4 bedrooms, 2 bath, 2 car attached garage, covered patio, pool, spa and extra large backyard. This is conveniently located around Rainbow and Blue Diamond, such an amazing find, won't last! *MUST SEE* QUICK SALE AVAILABLE. Appraisal completed & Seller is moving out! Gorgeous courtyard complete w/ fireplace to xD; xA;your sky-lit living room & the kitchen hosts a bar to serve guests while cooking & preparing on your xD; xA;generously sized island w/ custom cut granite counter-tops. The back doors open to a generous, over-sized lot with xD; xA;a large PRIVATE back yard, one of a kind custom built patio cover, with a Tuffshed for xtra storage. 2016 WILLIAM LYON HOMES!! THIS GORGEOUS 3 CAR GARAGE 2 STORY HOME LOCATED AT THE GATED COMMUNITY @ HEART OF SOUTHWEST. 4 BEDROOMS 4 BATHS. OVERSIZE MASTER BED AND BATH UPSTAIRS AND A SECONDARY MASTER BED/BATH DOWNSTAIRS. 10 FOOT CEILING, 8 FOOT DOORS IN AND OUT AND A BEAUTIFUL BACKYARD LANDSCAPING WITH COVERED PATIO. WOW! Like new 4 bedroom 3 bath DR Horton home with 2 master bedrooms and 3 car garage! 10ft ceilings with 8 ft doors, 42 cabinets, and soft close drawers. Formal dining and plenty of room for storage. Beautifully finished backyard with RV parking and hookups all on a 10k sq ft lot! Water conditioner and reverse osmosis system. xD; xA;NO HOAs in this neighborhood!! !